Sleep is often said to be ‘the best medicine’ – and a new study proves the old adage true. Researchers have shown that sleep improves the potential ability of some of the body’s immune cells to attach to their targets. Their findings, published in the Journal of Experimental Medicine, help explain how sleep can fight off an infection, whereas other conditions – such as chronic stress – can make the body more susceptible to illness. T cells are a type of white blood cell that are critical to the body’s immune response. When T cells recognise a specific target, such as a cell infected with a virus, they activate sticky proteins known as integrins that allow them to attach to their target and, in the case of a virally infected cell, kill it. While much is known about the signals that activate integrins, signals that might dampen the ability of T cells to attach to their targets are less well understood. Dr Stoyan Dimitrov and colleagues at the University of Tübingen in Germany decided to investigate the effects of a diverse group of signaling molecules known as Gαs-coupled receptor agonists. Many of the molecules can suppress the immune system, but whether they inhibit the ability of T cells to activate their integrins and attach to target cells was unknown. The researchers found that certain Gαs-coupled receptor agonists, including the hormones adrenaline and noradrenaline, prevented T cells from activating their integrins after recognizing their target. Dr Dimitrov said: “The levels of these molecules needed to inhibit integrin activation are observed in many pathological conditions, such as tumour growth, malaria infection, hypoxia and stress. Dr Dimitrov and colleagues compared T cells taken from healthy volunteers while they slept or stayed awake all night. T cells taken from sleeping volunteers showed “significantly higher” levels of integrin activation than T cells taken from awake subjects. 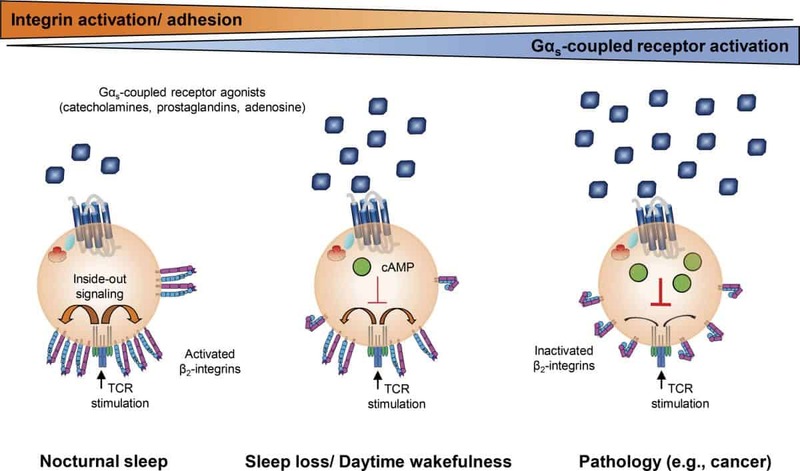 The researchers were able to confirm that the beneficial effect of sleep on T cell integrin activation was due to the decrease in Gαs-coupled receptor activation.